Some news outlets continue to report that the Postal Service is “hemorrhaging cash.” While that line may add drama to a story, it is incorrect. The fact of the matter is the that Postal Service has accumulated $6 billion of cash on its balance sheet. 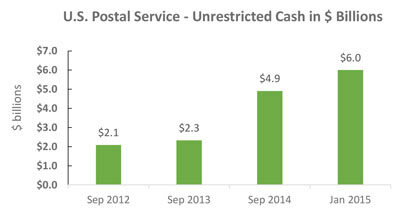 This reflects a nearly three-fold increase from USPS’ cash balance at the end of fiscal year 2012.This increased cash balance should provide the Postal Service with some additional spending flexibility for capital investments. How did this happen you might ask? Cash on the balance sheet accumulates when sales of stamps and other postal products generate more money than the Postal Service spends. In addition to the USPS’ $1.4 billion operating profit in 2014, the significant increase in cash on the balance sheet is another sign that the Postal Service’s operations have improved. This is due in no small part to the hard work of letter carriers during the holiday season. Postal Service cash balance improves | National Association of Letter Carriers AFL-CIO. or….the impact of the exigent surcharge, reduction in costs of supporting an outsized infrastructure in relation to mail volume, and the precipitous rise in package volumes – especially from UPS and FedEx, who use USPS for the final mile of delivery.